Leaving no stone unturned in the quest for sales, BMW has spun yet another model from its 3/4 Series models with the creation of the 4 Series Gran Coupe. Following the basic template of the 6 Series Gran Coupe, the 4 Series version brings the more stylised exterior of a coupe but with the practicality of four doors. There has always been a strong demand for the BMW 3 Series regardless of bodystyle, and the Coupe model has always been a strong seller. However there is a sub-genre of coupe that has become more popular in recent years, with a four-door coupe giving a greater sense of style than an ordinary saloon with a slight compromise in terms of practicality. At first glance the 4 Series looks roughly similar in size to the 3 Series saloon, but there the similarities end. The 4 Series' basic silhouette is related, but actually the number of differences are numerous and the vast majority of panels are different. The 4 Series has different headlights and bumpers, wider wheelarches and 'air breathers' - small vents in the front wings to aid aerodynamic performance. 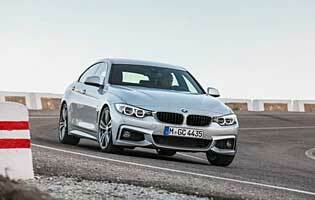 Mechanically the 4 Series carries over much of its layout direct from the 3 Series saloon. The front engine and rear-wheel drive layout remains identical, although the suspension on the 4 Series is stiffer across the range as well as lower, helping it to have what BMW claims is the lowest centre of gravity of any of its models. The 4 Series also comes with a reduced engine range compared to the 3 Series, with the pick of the diesel and petrol engines offered with a choice of manual or automatic gearboxes. 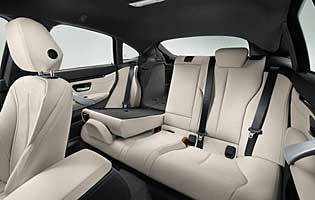 On the inside the seats are mounted 9mm lower than in the saloon 3 Series which BMW claims increases the sporty feeling. 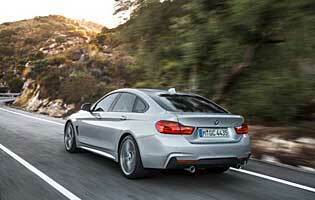 Undoubtedly a niche within a niche, the 4 Series Gran Coupe nonetheless offers an appealing overall package. The sharper exterior is a welcome change from the ubiquity of the 3 Series saloon, while the driving experience remains typically excellent. If it has to be a compact-sized BMW, has to have four doors and must be more stylish than the saloon, this is the car for you.